I'm sorry to have to report that a Shipmate of ours and a good friend of mine has passed away. I had sent a Christmas card to Herman and Olga Fritzke this year although I have not heard from them for quite a long period of time. I knew they had moved up into the West Point, New York area to be with their children. I believe they have three daughters. Last time I talked to Herman was probably 8-9 months ago, I had called him on the phone see how he was doing, and at that time he told me that he was not doing real well. Herman was a very good friend of mine. We first met at the ships reunion in Norfolk, Virginia years ago, just after the 9/11 issue started and the shipyard was closed down to visitors. Herman being a full Captain (retired) got us into the shipyard so that we had quite a nice tour and we had been friends ever since. I am sad to have to send this message to you. I'm attaching a copy of the obituary and card that I got from Olga. My best regards for a Merry Christmas and Happy New Year to all. It was great seeing all of you at the recent USS Renshaw reunion in Ft Myers, FL. 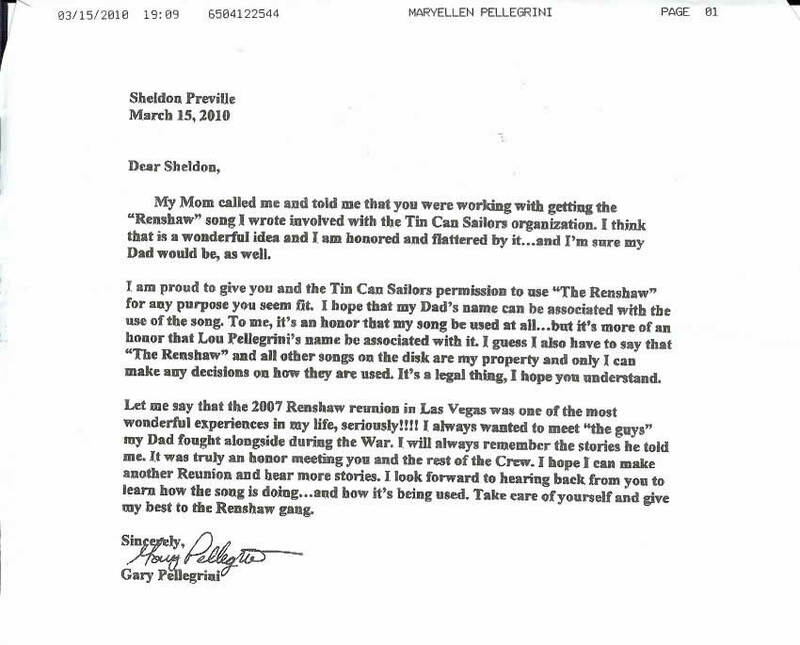 the son of shipmate Lou Pellegrini. Lou lost his battle with cancer in April of 2008.
played during the reunion. It tells the story of the life and death that men endure on a destroyer. (800) 223-5535 to order direct. Ask for item #: VT-3. Part of the cost goes to help The Museum Ships. These Museums of US Navy ships is in dire need to continue running efficiently. Your help is greatly needed and appreciated. 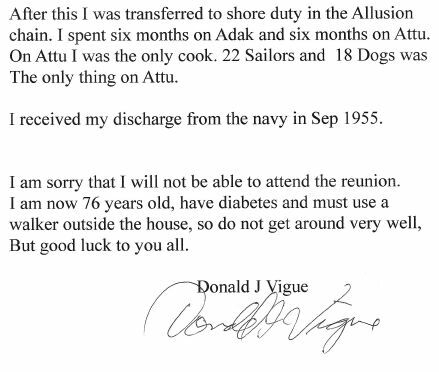 Attached is more info, some of which was printed in the Tin Can Sailor Newspaper. Jack Katz on the Renshaw web site. problems. He is in good spirits, and sends his regards to all. I am sure he would enjoy hearing from his many concerned shipmates. 1500 Sheridan Road, Unit C, Willamet, Ill,60091. It is with a heavy heart that I forward the news of the passing of CDR Charles Edward Breen, former Commanding Officer of USS Renshaw. CDR Breen served as CO from January 1966 until September of 1967. CDR Breen is my grandfather in law and I was always fascinated by his stories of his time on the Renshaw and his time in the service. I was doing some research on the Renshaw when I came across your website. I believe we have some pictures of the Renshaw during his time as CO. If you would like copies of them, please let me know and I will scan them and send them at the earliest possible time. I have included a link to his obituary in a local paper: http://jacksonvilleprogress.com/obituaries/x597293489/Charles-Edward-Bud-Breen-Jr. Thank you for your excellent website and your service to our country, and the service you continue to provide with this great website. Forgive me Bob Hogan, who also joined us in Fort Myers. Blame my forgetfulness on the computer!! I've collected several good Reunion 2011 photos to post on the site. I'd like to put all the new pics up at one time, so if you have any good, high-quality pictures in your camera, please email them to me now. I will be working on this in the coming week. 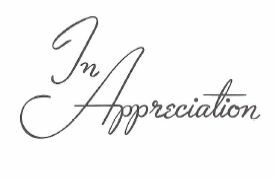 JUST A COMPLIMENT TO THE REUNION COMMITTEE FOR THE EXCELLENTLY PREPARED AFFAIR THAT WAS HELD IN FORT MEYERS FL.ALL THE BIG AND LITTLE THINGS WERE IN PLACE TO ASSURE A GREAT GET TOGETHER.THE ATTENDANCE WAS GOOD AND MADE EVEN BETTER BY THE PRESENCE OF TWO OF BILL HOGAN’S DAUGHTERS, BARBARA AND SUE. I,M SURE THEIR FATHER IS VERY PROUD OF THEM. A TOTAL OF 27 SHIPMATES WERE ABOARD THIS REUNION INCLUDING 6 WWII VETERANS. ALSO, THANKS TO THE MANY LOYAL GUESTS THAT WERE PRESENT IN FORT MEYERS. START THINKING SAN ANTONIO NOW!! 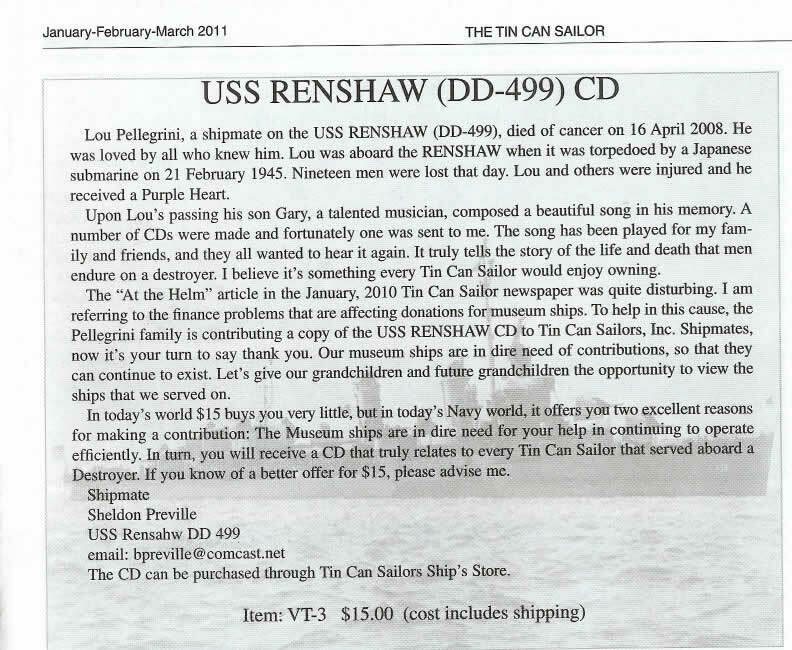 Shipmate Don McElfresh has alerted us that "The Tin Can Sailor," newspaper of Tin Can Sailors group, has an article in the latest edition written by our late shipmate, Bill Hogan. 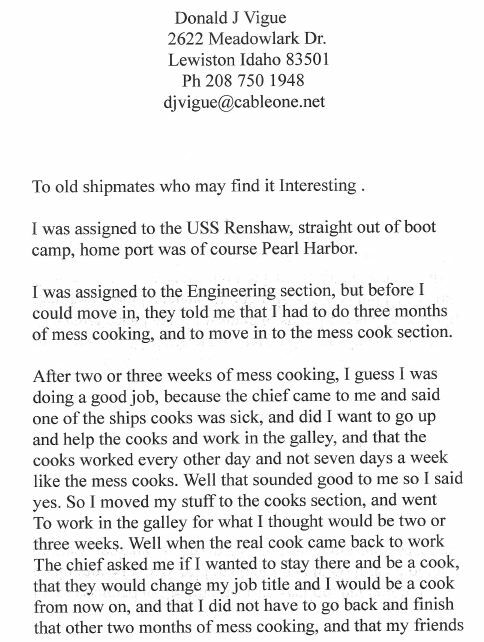 It's a very interesting artical entitled, "To the Crew of the USS RENSHAW (DD-499)". It begins on Page 8 of the July-August-September 2011 issue. As noted below on this site, we lost Bill earlier this year. The reunions will not be the same without him. We know that every Renshaw shipmate who served with Bill, or who knew him from the reunions over the years, will want to read this article. We received an email from Diane Rovelto this past week. She is seeking information on her father-in-law, Kenneth Marvin Rovelto, who was stationed aboard our ship during WWII. Shipmate Rovelto was born in 1921 and he passed away in 1993 at age 72. He enlisted in the Navy in October, 1942, at Providence, RI. 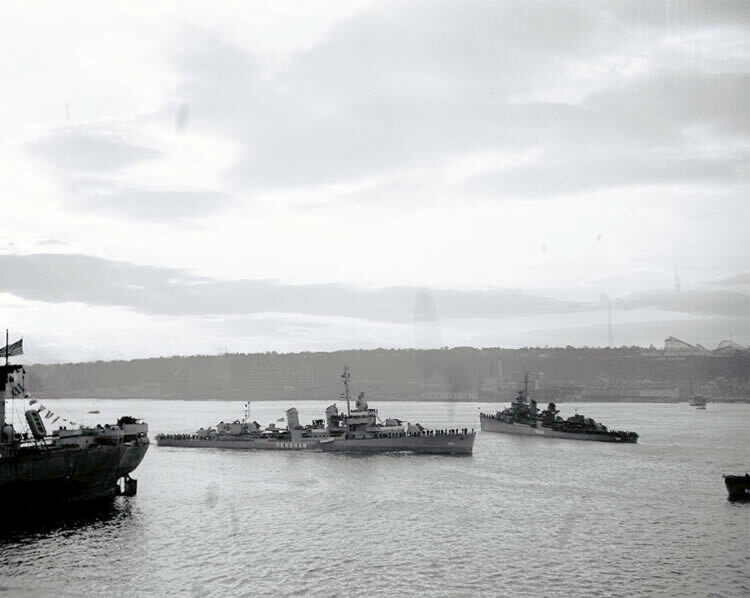 He reported aboard the Renshaw in December 1942 as a S2c V6. Subsequent muster lists show him with rank of S1c later in 1943, Coxswain in 1944 and BM2c (T) in 1945. 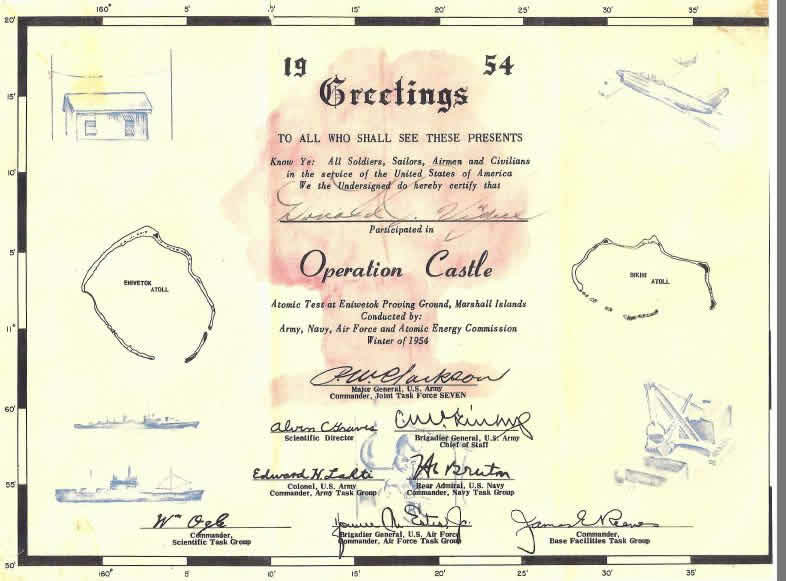 If any of our WWII shipmates can help Ms. Rovelto with information or answers to her questions about her father-in-law, please click on her name (above) and contact her by email. 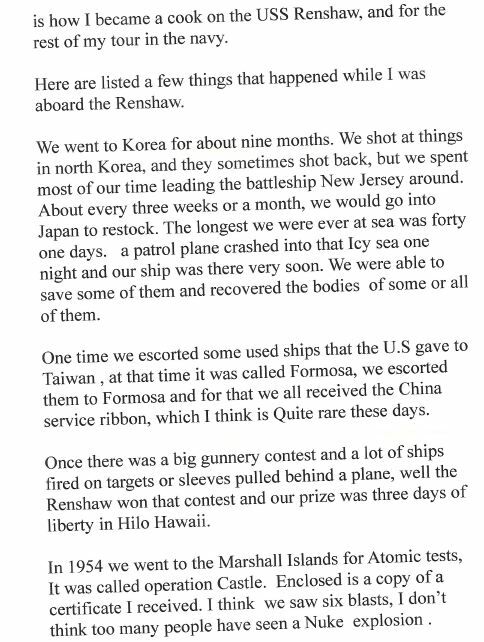 This is from the family of James D. Giddings, son of shipmate Jim Giddings. March continues to be a time of sad news from our Renshaw family. Please keep shipmate Jim Giddings and his family in your thoughts and prayers. Jim's daughter-in-law, Michele L. Giddings, passed away earlier this month after a long illness. She was the wife of Jim's son, James D. Giddings. Michele was 42 years old. James is a former crew member of the USS Hancock (DD-981) and served during the first Persian Gulf conflict in Kuwait. I wanted to let you know that my father, Francis "Frank" Thomas Kleber, who served on the Renshaw from 1950-1952 passed away on February 22, 2011 in Chula Vista, CA. I would appreciate it if you would make this change on the Renshaw website. Sad follow-up to previous posting. 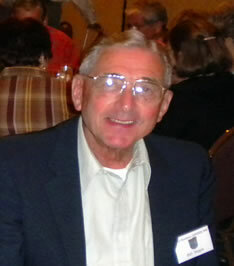 Our shipmate and buddy, Bill Hogan, passed away on 22 March 2011. No further details are available at this time. Contact Jan McCurry for info on contacting the family. 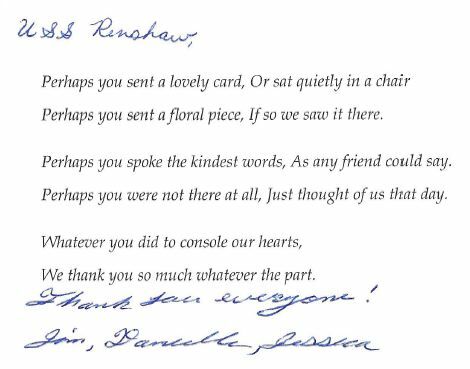 Bill has attended many Renshaw reunions over several years and he will be missed by all of us. We learned today that our shipmate, Bill Hogan, is having some medical problems. He's in the Mayo Clinic for some tests right now. He is reported to be weak and is experiencing some trouble swallowing. Please keep Bill and his family in your thoughts and prayers. We hope he's better soon, and we'll be looking for him at our Renshaw reunion in September. Jerry Vandenberg just learned that our shipmate and friend, Waymon L. "Hank" Snow passed away in 2010. Hank was an Engineman on Renshaw in 1959-60. He was EN1 and later made ENC while aboard. Later in his career he had a tour as manager of the Chief's Club at Yokosuka and went on to become the Engineman detailer in BuPers in Washington. Hank was 76 years old. Happy New Year 2011. With this, we start our info notes file for the new year. Let us hear from you. We don't have means for you to post your note here directly, so just send it to me in an email and I'll put it up.